On our last day of the trip, we went on a tour to Las Caletas Beach Hideaway, the once-home of film director John Huston. It is now owned by Vallarta Adventures, a well-oiled machine of a tour company that brings groups of tourists out to this nature preserve hideaway twice a day. It is peaceful and beautiful, and I highly recommend the trip if you want to escape the craziness of PV. There are plenty of activities – from paddle boarding to scuba diving to hiking to simply sitting on your bum and drinking cocktails. 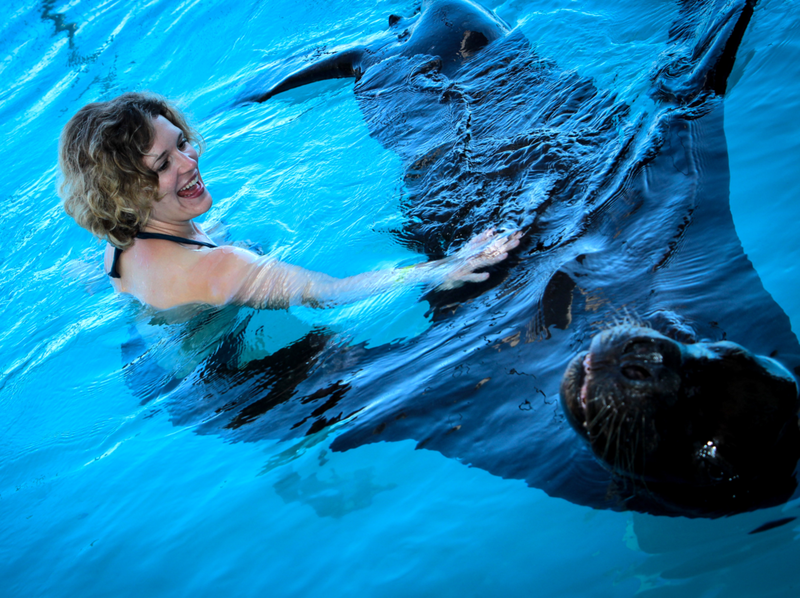 The highlight of my experience was swimming with a rescued sea lion named Litibu. I was the only person who chose to do this activity at Las Caletas that day, so the real treat was being alone in the pool with him. Litibu and his friends were rescued from Uruguay in South America where the sea lion population is out of control. Las Caletas has a small facility where they were able to take in four of these animals to give them a better life and chance at survival. Apparently Uruguay will pay places to rescue animals as a more humane version of population control. At Las Caletas, they get to swim free in the ocean every day, have wonderful health care and as many meals as they need. In their original home in South America, it is believed they would’ve died. I chose to buy this story but I did ask why no one else had signed up to swim with the sea lions that day. They explained to me that people are leery to participate since the stories around Sea World’s animal abuse have surfaced. It has been my dream to touch and swim with a giant sea creature for some time now, and here was my chance – 30 amazing minutes with Litibu! What was he like? He liked to cuddle, was about 4 years old, knew a lot of tricks and was, no surprise, motivated by food. I laughed and cried and had a blast. It was a really special experience for just me, and I am so grateful I had the opportunity. I highly recommend Ocean Friendly Whale Watching tours. This tour company is run by marine biologists who respect the space of the whales, use the findings for their own research and have hydrophones they use to listen to the whales. When I say respect the space of the whales, I mean that a lot of boats are out on Banderas Bay looking for them. The whales can become crowded, will get scared off, and leave the area. At one point, too many large boats were circling a pod, so we pulled out and went to a different part of the bay to find more whales. Humpback whales travel down to Banderas Bay every year at this time to mate, so there are a number of pods that surface across the bay to come up for air on any given day. You knew they were about to show by looking for the puff of water coming out of their blow holes. We’d see their backs crest a few times before the tail came up. When that happened, you knew they were going back down under water for about 20 minutes. Patience is a virtue while whale watching! And then something very cool happened. A group of ‘False Killer whales’ showed up, numbering in the hundreds! They would surface 3-4 at a time in various groups all over the bay. The researchers explained that they hadn’t seen two groups of whales together in eight years, so it was a really big deal! My favorite part of the day was when they pulled out the hydrophone – a device for listening under water – to hear the whales talk to each other. Here is my recording of the sounds they were making underwater (apologies for the mediocre videography – the sounds are the main attraction). The whales made a combination of really high-pitched and very low-pitched creaking noises – the latter is what you’ll mostly hear in this video but if you listen closely there are some higher notes. At first the researchers thought the high notes were dolphins but when the False Killer whales showed up, they realized it was those guys they were hearing alongside the Humpbacks! Humpback Whale Singing through Hydrophone from Elise Giannasi on Vimeo. I think the biggest lesson I learned on our trip is that not every vacation will work out to be your dream vacation. That was a bit of a fall from innocence for me since the word “vacation” carries so much pressure to be perfectly tranquil and relaxing. 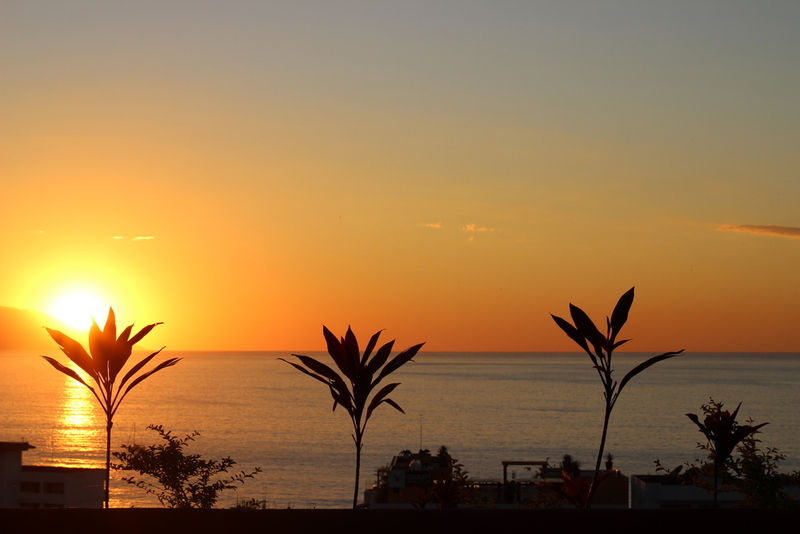 As I looked back on it wondering how I’d write about the trip in a positive light, I kept coming back to this photo of the sunset in Puerto Vallarta. It was truly extraordinary and I was mesmerized by it every night watching it from the roof of our hotel. Swimming with a sea lion and watching/listening to whales were truly special moments, too – in fact, these are all miraculous things to celebrate and experience. So while PV may not be my favorite place in the world, I will take a humble moment right here to appreciate the fact that we were even able to travel in the first place. 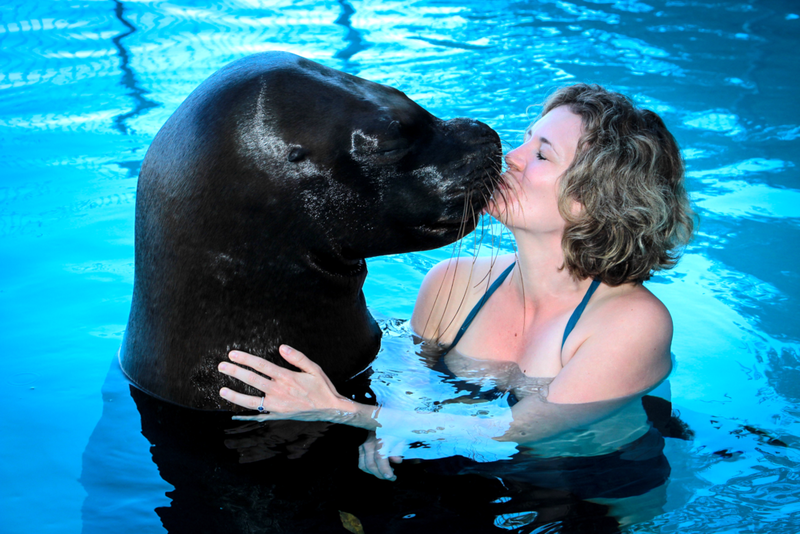 Oh – and I kissed a sea lion, which is definitely something to be proud of. Next Post JET SET GIVEAWAY – MARCH 16th-19th – ONLY ON INSTAGRAM!